Friedrich August Becker and his wife Dorothea nee Domens. Died: 5th November 1899 at Appila. Gustav was born on the 29th November 1836 at Janny, near Prittag in the Grünberg District of Silesia, the son of school teacher Friedrich August Becker. Janny (sometimes ‘Jany’) was a small village about 8 kilometres north east of Grünberg, the main centre of this area of Silesia and a large place. On the bottom side of the world a small village had been founded in 1836, the same year Gustav Becker was born. The new village was called ‘Adelaide’. It was the first village in a new British colony the British named South Australia, and it was ruled from Britain. When Gustav was one year old Queen Victoria was crowned as the new ruler of England and her colonies. Queen Victoria was raised by her German mother. She married the German Prince Albert and they had 9 children. The British monarchy in Gustav’s lifetime had far more German blood than English. Any foreigners who wanted to buy land in the new colony of South Australia had to first swear allegiance to Queen Victoria. Gustav would later do this. [This law didn’t apply to the local aboriginal people who had lived there for countless thousands of years. They couldn’t ‘own’ land in South Australia at this time.] Queen Victoria ruled until she died about a year after Gustav died in South Australia in 1899. When Gustav was born there was no Country named ‘Germany’. The area we now call ‘Germany’ was a collection of different states and Kingdoms – with their own Royal families – who had regularly fought wars against each other over the previous centuries. For example, about 25 years before Gustav was born the French army led by Napoleon fought against Gustav’s Country, but the German Kingdom of Saxony fought with Napoleon against Prussia. In Australia one of Gustav’s children would marry into the Zwar family. The Zwar’s were from the German kingdom of Saxony. Prittag [now Przytok] lies today in Poland. Gustav grew up in the top corner of Silesia. If he walked north about three k’s from Janny he came to the German State called Brandenburg. 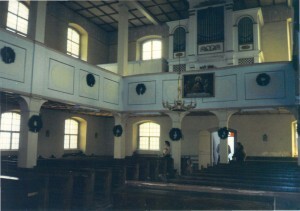 In Silesia the Becker family worshipped in the Lutheran Church at Prittag. I have video of my wife playing the pipe organ in the Church in 1994. 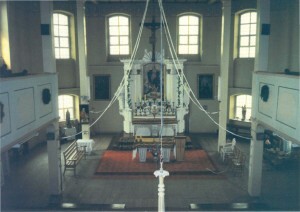 Janny was in the Lutheran Parish of Prittag. It had a population of 231 in 1905, and was in the County [Kreis] of Grünberg. The Lutherans who settled in the Barossa Valley in South Australia named one of their churches ‘Grünberg’. In Silesia the Grünberg district had been famous for centuries for its grapes and wines. The town had a population of 14,000 people in the late 1800’s. Today it is a city in Poland (and is now called Zielona Gora), with a population of over 300,000 people. When a host took my wife and myself for a visit to Janny, Prittag and Grünberg in 1994, I said that I was amazed to see that Grünberg was a city with one of the largest churches I have ever seen in it’s centre. He asked me to consider the shock he felt when he was in the Barossa Valley on his only trip to Australia and his hosts pointed to acres of vineyards with a tiny little church on a rise, and some cows grazing nearby, and they announced “That is Grünberg”! Gustav Becker qualified as a wheelwright. This followed a strenuous apprenticeship, followed by demanding journeyman requirements. One had to get special (and costly) permission from the authorities to open a trade in one’s local area, and this was virtually impossible to achieve if there were already enough wheelwrights in the local community. This could have been a reason for Gustuv considering going to Australia on the other side of the world. In 1841 over 100 people had left the Grünberg District for Australia with Pastor Fritzsche as their leader. This followed persecution and prison sentences ordered by the King of Prussia and his government for anyone not joining in the decree that the Lutherans and Calvinists must combine so there would be only one Church in the Prussian Kingdom. The King who made these decrees had actually died in 1840 and the persecutions ceased and the decree was cancelled in 1844, but the plans of the emigrants had been made and properties sold so the emigration to Australia went ahead in 1841. In 1844 another 21 left the Grünberg District and went to Australia. In future years many more people would emigrate to Australia from Silesia, but the reason was no longer religious persecution. There were many reasons people left German countries, including the reports of gold rushes in Australia, or the compulsory military service for two years for all 20 year old males into the army to go and fight in wars. Parents who had lost a son or two in battles didn’t want any more of their sons involved in military service. The industrial revolution, firstly in England, meant machines and factories were producing materials and goods previously produced in thousands of little villages and the people in villages in Europe now experienced poverty. It is estimated that between 5 and 6 million Germans left Europe in the 1800’s for the New Countries overseas, mainly to the Americas. A trickle made their way to Australia. It was twice as far to go from Europe to Australia as to North America, and it also cost double the price. The shipping agents who scoured the countryside for passengers really had to work hard and tell wonderful and fantastic stories about Australia to get people to pay up and board a ship to Australia. The agents were paid a certain amount for every person they could get on board a ship. Some agents even pretended they and their family were going too! Children under 14 years were half price or less and some mature teenagers went on board and were still listed as children when they arrived in Australia! Gustav Becker made his way to Hamburg to board a ship in 1860, long after the religious persecution of Lutherans had ended. The gold rushes were still making the newspapers. There were letters from friends and relatives in Australia, sometimes published in the local newspapers, telling how one could even buy land if one worked hard. In Silesia only the richest people like ‘Lords’ owned large tracts of land. There is a List of 77 passengers. “Gustav teamed up with a partner and they worked in the Adelaide Hills searching for gold, but his mate cleared off with their finds.” [Grandson Melvin Becker to Kevin Zwar]. 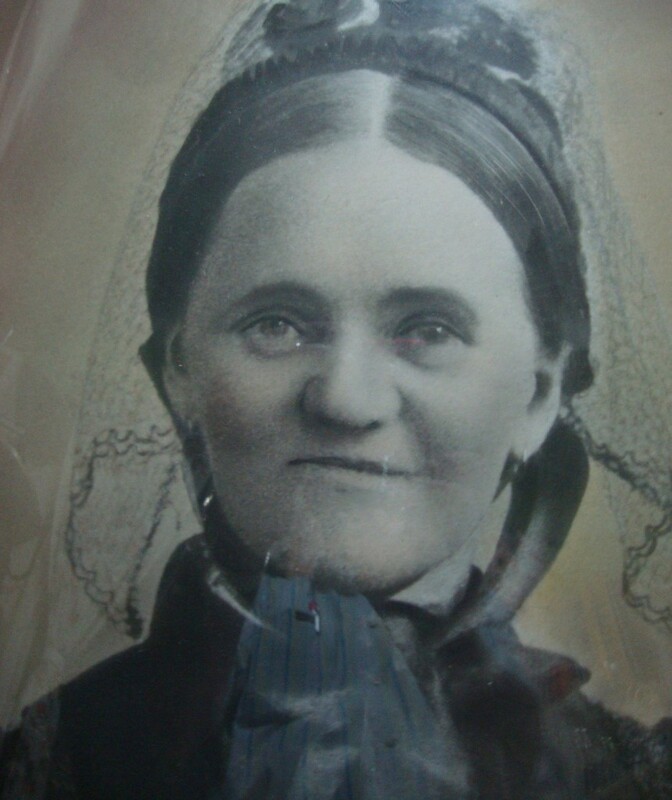 When he was 26 years old Gustav married Auguste Ernestine Gunder on 24th September 1863 at Neukirch in the Barossa Valley. Auguste had been born on 27th March 1842, and had emigrated to Australia in1849. She had lived for a time at Light Pass and then at Neukirch. The official papers state that Gustav Moritz Becker of Neukirch near Stockwell, a wheelwright, and native of Janny, aged 28 years, applied for citizenship and then took the oath of allegiance on the 28th day of April 1865. One had to be naturalized to purchase land in the new British Colony of South Australia, so it is likely Gustav bought or intended to buy land soon after this date. They had moved north to Appila and bought virgin land. They would need to build a home, and here on this farm they would have seven children. Gustav was a qualified wheelwright. 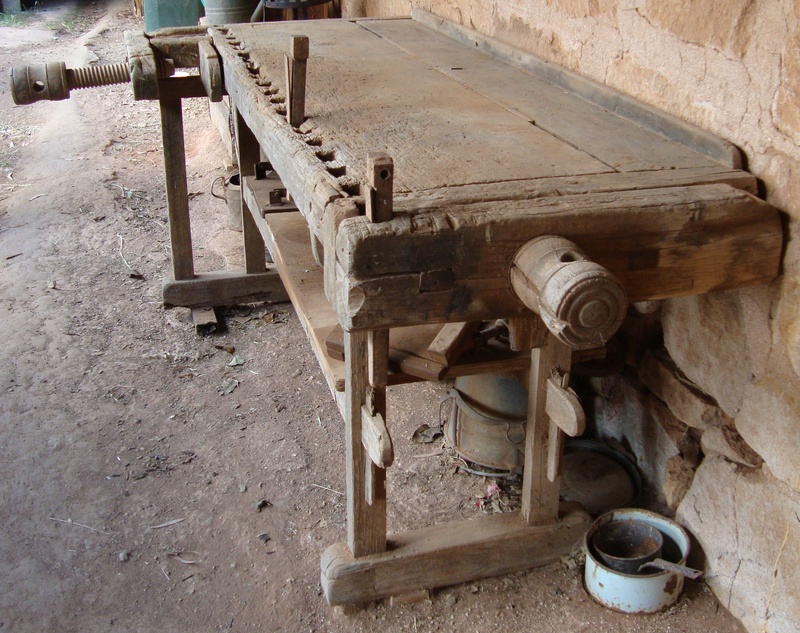 Above is the workbench Gustav made from red gum timber for his workshop where he produced a variety of articles including horse drawn carts and drays. 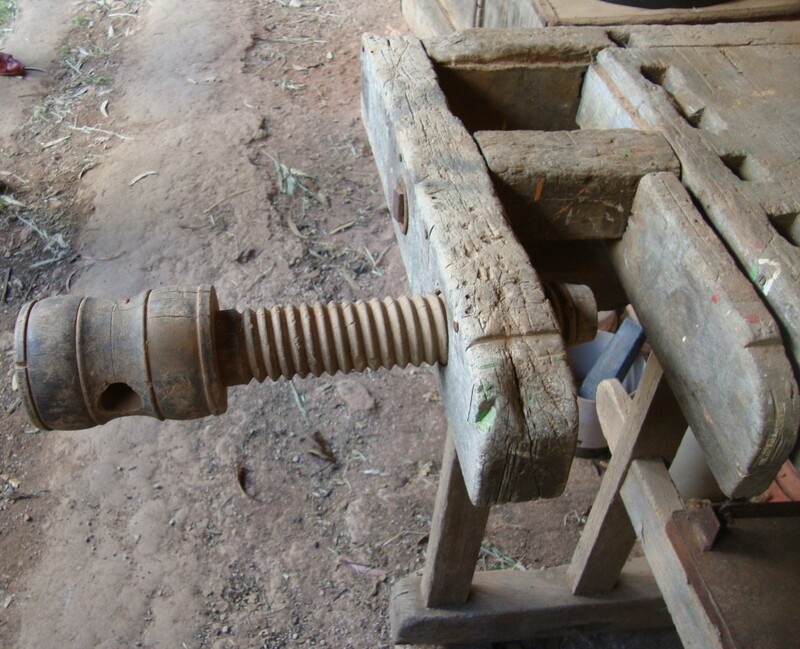 The screw on the workbench made by Gustav Becker. Some of his hand tools have been handed down through his Becker decendants. Gustav also farmed the land. Many of the emigrants from German Kingdoms who were qualified in a wide field of occupations bought up land and became farmers. It was only the ‘Lords’ who owned the land back home where they had grown up in Europe, and it was a great achievement for the son of a schoolteacher to be able to buy acres of farmland and live like a Lord! Gustav became involved in the Lutheran Church in its earliest days before there were any Lutheran schools, churches or pastors in the Appila area. I have attempted to keep this part of the Becker history as simple as possible. There was a Hugo Becker with a large family who was a school teacher and who played an important role in the early years at Appila. He wasn’t related to Gustav Becker, so to avoid confusion I haven’t mentioned Hugo in the following account of the early years. 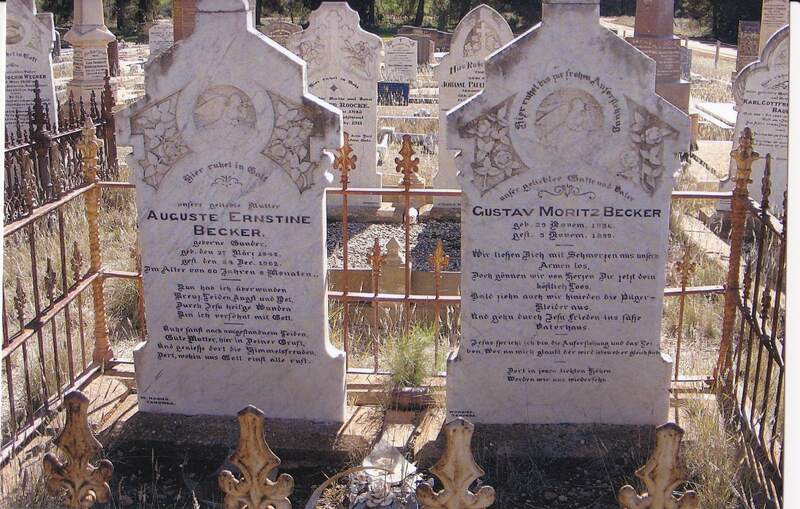 In the early days of European settlement in South Australia one found a wide variety of German folk from many different German States and Countries. In the churches they came from they had different hymnals, devotion books and customs. For example, in some Lutheran Churches the males sat on one side of the church, and the females on the other side! Wives couldn’t sit next to their husbands! The men went to the Lord’s Supper first, and then the women. Some sang three hallelujahs at the close of the service, and others only one. One could feel uncomfortable if one came from a different Lutheran background in Europe. In Australia the laypeople now had to make many decisions and take on responsibilities, like paying for and building a church, or deciding which Pastor to call, and then providing a house for him and his family. Most of these decisions were made and paid for by ‘governments’ in Europe. Suddenly the lay people had important roles to play, and I think it is fair to say there were times they didn’t handle it the best ways possible! Lutheran Pastors who came from different countries and kingdoms in Europe had trained in different seminary’s and sometimes were suspicious of each other. It took 130 years before the Lutherans could all belong to the same Lutheran Church in Australia – and even then several congregations and a pastor or two chose to remain quite separate. Gustav Becker bought land near Appila when it was first opened up for sale in 1872. A house needed to be built and the land fenced and cleared for farming, and crops sown to get some income. Pastor Rudolph Ey lived and worked in a parish at Carlsruhe a hundred miles south of Appila. It seems he made a trip North to visit some of his members and other Lutherans who had moved to the Appila area in 1872. The following year he went north again and took services, including one in the Ernst Joppich home near Appila. In 1875 Pastor Ey dedicated a chapel on Joppich’s farm [section 15]. It became known as the Pine Creek Chapel. Gustuf Becker was one who worshipped there. During the week the chapel building also served as a school. It would serve as a school for 100 years and many Becker descendants had their education in this building. But not immediately. Gustav belonged to one of two different groups of Lutherans who worshipped together in 1875. 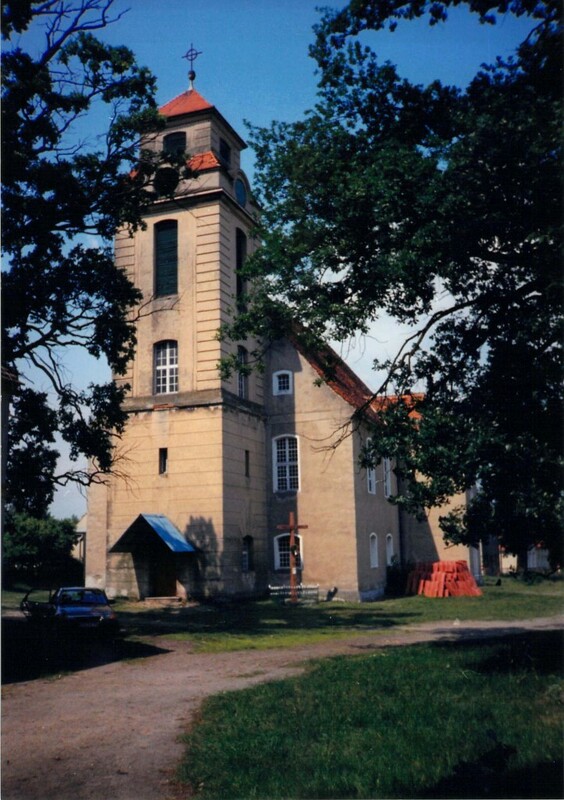 Within a year or so the two groups of Lutherans decided they couldn’t worship together and it seems for a few years they worshipped separately, in the shared chapel, and the group Gustav belonged to [Later known as the ELCA Synod] later met together in the Pech family home. After several years they were ministered to by Pastor Johannes Thiessen. Please Note: The following account of Becker land and another school and congregation is partly assumptions and guesswork as there are no records apart from the Appila land records and the fact it is mentioned in early letters, including some written by Gustav himself, and published in the book “They Went North” by Rhonda Traeger. but this is questionable as Gustav Becker only bought the property the following year in 1880. It seems there was a ‘house’ of some sort on the property, and it is possible the little congregation built a new school plus a house for the teacher. At one stage Gustav offered the new house, at that stage not yet completed, as a possible manse for Pastor Thiessen, but changed the offer to the old house which needed improving, and when he moved there Pastor Thiessen had to make improvements himself. By this time virtually all of the members had fallen out with Pastor Thiessen and he moved away to Caltowie (where he lived in a house he owned). There is no record of teachers and students at this school. At one time, about 1881, a young teacher named Wachtel arrived at the start of a new school year. He started on Monday morning, and taught until Friday afternoon and then he shot through! He may have been the last teacher at the school. In 1881 the congregation bought a section of Becker’s section 17 so the congregation could own the Chapel land, now held for the congregation by three trustees. [It would be sold in 1919, and the Gloria Dei Church built on the new property (Borgas) on section 111]. In 1881 Pastor George Dorsch arrived with his wife. He was the first pastor to come to Australia from the Missouri Lutheran Synod in America. In the next century almost countless pastors would follow him from America and serve in the ELCA Lutheran Synod in Australia. Pastor Dorsch moved on after only two years. For some years the congregation would struggle to get a pastor and some families joined other Lutheran congregations in the District. The Appila Land Records show that Gustav Becker bought section 2 & 72 on 23rd February 1889. This would pass on to Gustav Adolph Alfred Becker fourteen years later on 31st January 1903. In 1927 it went to Wilhelm Hermann Julius Schultz. 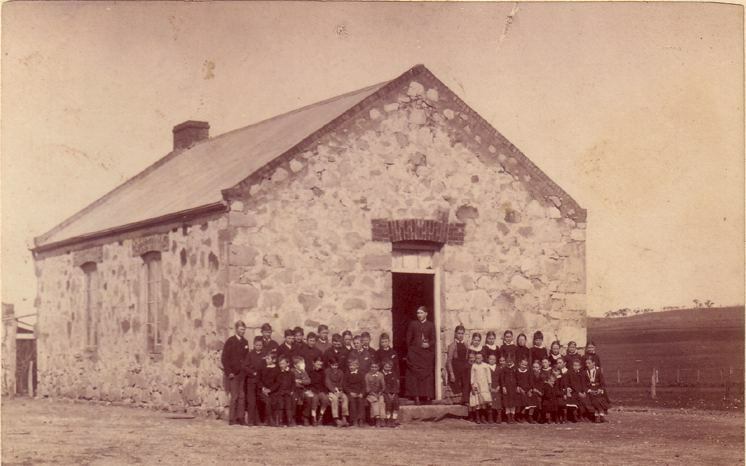 After the ‘Becker’ school closed the children of both groups attended the school at Pine Creek. It was also natural that children of the local German/Lutheran families would intermarry, and newly weds then had to decide which congregation they would join. At some stage Gustav Becker and his family seem to have joined the Pine Creek Lutheran congregation. There was only one Lutheran Church in the Appila district that had a cemetery, so many are found in the same resting place in the Pine Creek Lutheran Church cemetery, on the same section of ‘Joppich’ land where the first Lutheran chapel/school was built and dedicated by Pastor Ey in 1875. Gustav Becker died at Appila on 5th November1899, of ‘calcinoma ventric Nephritis acuta’ [Rita Zwar nee Becker]. He was buried in the Appila Lutheran cemetery, aged 63 years. Death of Mr. Becker. – It is our painful duty to chronicle the death of an old and respected resident of this district (Mr. G. Becker), which occurred on Sunday last at his residence near Laura. The deceased gentleman had been in ill-health for the past eighteen years, and a little over a week ago had an attack of influenza from which he never recovered. The late Mr. Becker (who was 62 years of age at the time of death) came to reside in this district twenty-seven years ago, and was one of the first settlers in Appila, prior to which he resided at Neukirk near Stockwell, where he was in business as a carpenter and wheelwright. In our district he was engagewd in farming pursuits. From the time of his entrance into the colony the deceased gentleman was very successful. He leaves a widow, four daughters (Mrs. Winter, Mrs. Zwar, Mrs Saegenschnitter, and Miss Becker), and three sons – Messrs. Alfred, Richard, and Gottlob Becker. The funeral took place on Tuesday last in the German cemetery near Pine Creek, and was largely attended. The Rev. Mr. Ottenburgher officiated at the grave. THE LATE MRS. BECKER. – We regret to record the death of Mrs. Becker (widow of the late Mr. G. Becker) which occurred on Tuesday morning last at her residence. The deceased lady was an old and respectred resident of this district, and was 60 years and 9 months old at the time of her decease. With her late husband, Mrs Becker came to reside in this district 29 years ago, previous to which she resided at Neukirch, near Stockwell. 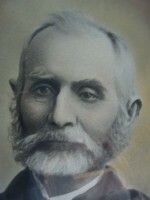 The late Mr. Becker died on November 5, 1899. Becker. – On December 23, 1902, Erstine Augusta, relict of the late Gustav Moritz Becker, of Appila, aged 60 years and nine months. May she rest in peace. The Appila Land records show that Gustav Becker bought sections 2 & 72 from James Clark on 23rd February 1889. It passed on to his son Gustav Adolph Alfred Becker 14 years later on 31st January 1903; then to Wilhelm Hermann Julius Schultz 5th April 1927.